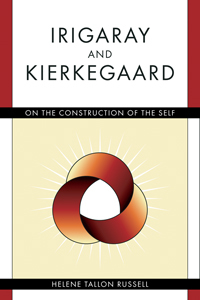 Irigaray and Kierkegaard: On the Construction of the Self is a creative construction of selfhood that begins by critiquing embedded assumptions that dominate current discourse. The apparent unity of the self is a problematic and fictitious conception. This construct is a prodigious illusion that not only has outworn its usefulness but also has become detrimental to more inclusive concepts of the self in which diversity and relationality are encouraged. This construct is particularly evident in the Christian doctrine of theological anthropology. This book both evaluates the supreme value ascribed to the quality of oneness in the Western theological tradition and suggests alternative conceptualizations of selfhood. First, the work analyzes Augustine’s formulation of Christian selfhood, which incorporates Plotinius’s claim that the one is the good, and thus identifies multiplicity with sin. Søren Kierkegaard and the French feminist Luce Irigaray both offer critical alternatives to such a unitary conception of selfhood. Kierkegaard views the self as complex, relational, and processive. The self consists of three pairs of polar elements, temporal and eternal, within three spheres of existence. The spheres and the elements are dialectically interrelated to each other. Irigaray criticizes the cultural and philosophical norms of Western discourse as phallocentric and monistic. This “economy of the same”—a system in which only one universal norm of behavior is accepted and valued—is built upon the repression of the feminine. She looks to women’s embodied experience to uncover the feminine. Her (psycho) analysis highlights that which has been repressed, such as multiformity and fluidity, to be an excellent candidate for the lost feminine. Russell argues that a dialogue between these two diverse thinkers provides a fruitful groundwork for reenvisioning and building up the concept of self as multiple, embodied, and relational.